Stateful middleboxes such as intrusion detection systems and stateful firewalls rely on TCP flow management to keep track of on-going network connections. However, implementing complex TCP state management for high-performance middlebox applications is non-trivial. Unfortunately, there is no networking stack that can be reused to help implement flow-level features needed for custom flow-processing middleboxes. The status quo is that the developers often end up implementing customized flow management submodules for their systems from scratch. Such practice is highly unscalable and error-prone. Our long term goal is to build a middlebox development framework called mOS (or middlebox Operating System) to assist middlebox developers with common, reusable functionalities needed for middlebox development. Our first release is its networking stack that offers a high-performance, user-space programming API specifically targeted for building software-based stateful monitoring middleboxes (Figure 1). Our library interface provides powerful event-based abstractions (see section 3) that can potentially simplify the codebase of complex middleboxes. We find that applications ported on mOS are more modularized than their counterparts as our stack can abstract intricate TCP state management tasks internally; allowing the applications to solely focus on custom middlebox logic. mOS programs are modular and can be made much smaller in terms of source code lines when compared to existing counterparts. Applications built on mOS deliver highly scalable performance. The framework automatically computes the TCP states of both endpoints of a connection while at the same time it allows the programmer to dynamically fine-tune the level of management for individual connections. For example, some applications require full TCP processing including bi-directional bytestream reassembly (e.g. signature-based IDSes such as Snort). Other network monitors only require inspection on the client-side (such as TCP/UDP port blockers) that don't even require bytestream analysis. mOS allows developers to dynamically adapt to such resource demand of the applications. Its modular design provides an intuitive programming API that a programmer can use to build custom middlebox applications. Moreover, our library can be easily extended to support higher-layer (L4/L7) protocols. The mOS stack is an extension of the mTCP stack that performs well in high speed networks. It works on any commodity multi-core CPU machines that host multi-queue NIC(s). Please refer to our requirements page for more details. Existing (open-source) stateful middleboxes often have flow management modules tightly integrated with their core logic, which often create complex code that is hard to maintain. Our interface allows clean separation of the middlebox logic from the networking core. The key observation for the API is that most middlebox operations can be defined as a set of flow-related events; and their respective callback handlers can be used to express a customized logic. 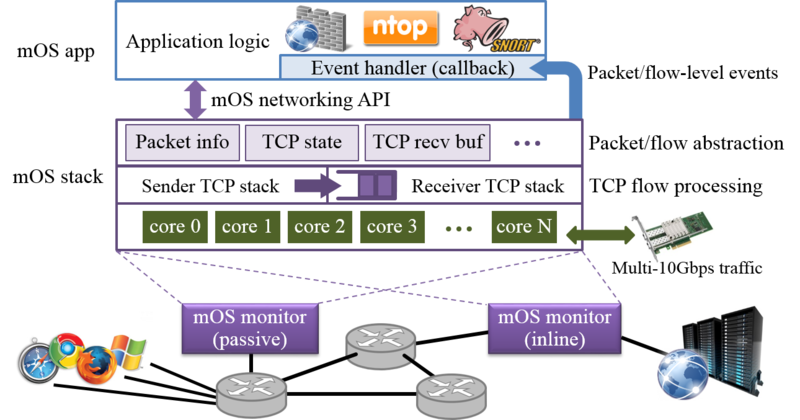 The mOS networking API provides an elaborate event interface for building middlebox applications. We have identified a list of key flow-related network conditions known as built-in events that represent notable TCP flow state change in a connection. Developers can write many applications with just built-in events and their event handlers. In case built-in events are insufficient, developers can define their own custom events called user-defined events. A user-defined event (UDE) can be defined as an existing event (called base event) and a filter function that detects the concrete condition of the event. The UDE is generated if the base event is triggered and its filter function (invoked as part of base event triggering) returns true. The mOS API defines a new socket type (MOS_SOCK_MONITOR_STREAM) used to monitor flow events in individual TCP flows. Figure 2. Initialization code of a typical mOS application (error handling is omitted). In the code above, mOSAppInit() first creates a passive monitoring socket (we introduce a new socket type for this purpose called MOS_SOCK_MONITOR_STREAM). We can restrict the kind of traffic the monitor can scan by using the mtcp_bind_monitor_filter() function. We register three events we want to monitor: one at the start of the connection (on SYN request), another for packet arrival (the callback handler is not shown) and the last on connection termination. In the example, we use two built-in and one user-defined mOS events for this purpose. A developer can register for these events either on the sender or receiver end of the stack (see next section for details). The registered event triggers OnFlowStart() and OnFlowEnd() functions for connection initiation and termination respectively. After the initialization of the application, mOS calls the callback handlers for those flows that trigger the registered events. For OnFlowStart() example function, the mOS core passes the active monitoring socket that is unique for each connection, a side variable (to indicate whether it is a client or a server) and the registered event id. A typical mOS (per-core) runtime instance is illustrated in Figure 3. The mOS core can be seen as a coupling of two mTCP stacks that simulate the states of both TCP endpoints. An ingress packet first runs through the sender-side1 stack. The packet triggers an update to its TCP state and records all relevant events. Next, the mOS core triggers callback handlers (MOS_HK_SND hook) if a mOS application has already registered for these events. It then checks whether the packet is retransmitted. Finally, this process is repeated with the receiver-side stack (MOS_HK_RCV hook). Our experience with porting some middlebox applications with the mOS networking stack has been positive. Code reduction: We ported Abacus, a cellular data accounting flow monitoring system that detects "free-riding" attacks. The original Abacus version relies on a custom flow management module that spans 4,639 lines of code. When we port Abacus to mOS API, the size of the program is reduced to only 561 lines of code (88% code reduction). Performance: We also ported Snort3, a multi-threaded signature-based software NIDS. By using mOS event-based API, we can replace Snort's stream5 flow management and http-inspect (HTTP preprocessor) modules. Our results show that we achieve analyzing throughputs similar to the Snort3-DPDK setup. mOS: A Reusable Networking Stack for Flow Monitoring Middleboxes Awarded Best Paper! in the SIGCOMM Computer Communication Review (ACM SIGCOMM'15 poster), Volume 45 Issue 4, Pg 355-356, October 2015.
in Proceedings of the 11th USENIX Symposium on Networked Systems Design and Implementation (NSDI'14 Poster), April 2014. Checkout the latest release of mOS at our github. Our release contains the source code of mOS library, sample applications, and a detailed tutorial on how to program stateful middleboxes using mOS API. You can refer to our detailed documentation on how to build and install new mOS applications. We are collectively reached by our mailing list: mtcp-user at list.ndsl.kaist.edu . This project is supported by ICT Research and Development Program of MSIP/IITP, Korea , under Grant B0101-16-1368, [Development of an NFV-inspired networked switch and an operating system for multi-middlebox services]. 1. Please note that both client and server can act as receivers and senders (and vice versa) depending on the direction of the flow.